In a world filled with social media and so much focus put on being the best, a lot of us find ourselves feeling less than and trying to fit into the mold of success according to society. Even though success is an individual thing, society has put its standards out there and a lot of us try to accomplish these standards even if it’s not making us happy. Don’t get wrapped up in the notion that meaning has to be something like being famous. We don’t find more meaning because of a paycheck or a title. What we do becomes more meaningful when we realize we impacted someone’s life. It’s the thank you notes, the smiles, the words of appreciation that makes us feel a deep sense of meaning. We can find meaning in two different ways. Finding a deeper meaning of life – why am I here? What’s my purpose. What’s important to me? What legacy do I want to leave? These are important questions in the big picture. Having purpose and meaning in our lives, helps give us direction, pick a career, lead us towards our interests and how we want to help the world. We can also find meaning in our daily lives. Ask yourself: How can we make a difference in small ways each day? How can you make someone’s life a little easier today? Touch someone’s life? 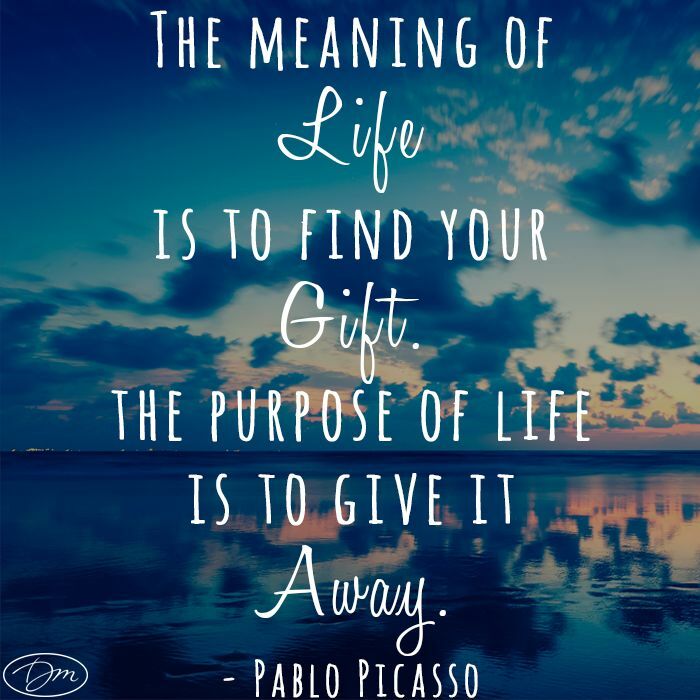 To find meaning in every day life, look at each day as a day filled with opportunities and possibilities to use your gift, make someone smile, share your legacy, connect with others and contribute to humankind in small ways. For some, work gives us meaning and purpose. For others, work pays their purpose. I have a client who wants to rescue dogs but needs money to see this dream come to fruition. She strongly believes her purpose is to take care of stray animals. Her job allows her to live out this purpose which brings great joy and meaning to her life. If you know the purpose of your life which gives your life meaning then you must ask yourself are you living in accordance to this purpose? True meaning is taking your purpose/gift (the reason why you are here) and sharing it with others. When you know your purpose, you need to continue to grow and learn, to challenge yourself, to take risks, this keep our purpose fresh and exciting. This entry was posted in Abundance, adult education, beliefs, Change, coaching, Conscious living, counseling, cultivate happiness, development, dream life, Goals, Gratitude, growth, happiness, Intention, Joy, life coaching, love, Mindfulness, non-credit courses, Parent, parenting, pay it forward, personal development, positive parenting, positive psychology, Positive Psychology coaching, priorities, pro-active, psychology, self help, self-care, spirituality, therapy, Thoughts, Uncategorized, values, workshops and tagged art, business, challenges, changes, classes, college, development, dreams, education, failure, family, Gratitude, grow, happy, health, inspiration, jobs, kids, kindness, learn, learning, life, lifestyle, love, Meaning, mental health, Mondays, motherhood, motivation, nature, nutrition, opportunities, parenting, power, psychology, Purpose, religion, school, sharing, spirituality, stress, Success, teaching, Thoughts, Truth, Women, work. Bookmark the permalink. Very well written. But, I think life has no purpose. Suppose, you have found your purpose of life and you have also achieved that. Then, what will you do next? you have completed your purpose. Do you choose death or another purpose of life? A long time ago, I wrote a post on it [ http://sayantideb.com/purpose/%5D. You can check it if you are interested in different views. Anyway, please, don’t take it personally, It’s my personal views. Thanks for writing and sharing your opinion. I feel that you purpose can change. We are always changing and growing but I feel that we have a purpose but I respect your point of view. I click your link but it said the article can’t be found. Could you resend? Would like to read it? Thanks for your raising this link issue. Hi! What kind of material do you write?